From UnofficialAmpeg.com: During MTI's ownership of Ampeg, everything was being built in Japan. Ampeg's most extensive line of pedals is no exception. In production during 1982 and 1983, the "A" series effects were housed in black steel boxes with brightly colored graphics in pinks, oranges, blues, yellows, etc., and included nine pedals and a "systems box". From what i can tell from the prices i've seen - these are very collectible pedals. Might be a nice subject for building your own. The semiconductors are not mentioned (other than 4558 as opamp) on the schematic, but as the transistors are used as buffers, you should be fine with 2N3904, 2N5088 or similar. The clipper diodes are silicon, so 1N4148 should be very close to the original. looking at the schematic, if i'm not mistaken, I think that the blue dot on the ground's double link should be moved down one row. Hmmm... That would ground the vref.. But there is an error with the left hand side 33k. I'll fix it asap. Nope. I don't see anything wrong with it. The schematic may throw you off as it uses standard ground symbol as vref and usual vref symbol as ground. so level 1 goes to Vref? Yes it does. It acts as virtual ground and there's a buffer after the volume control, so that is ok. I built this one this morning. 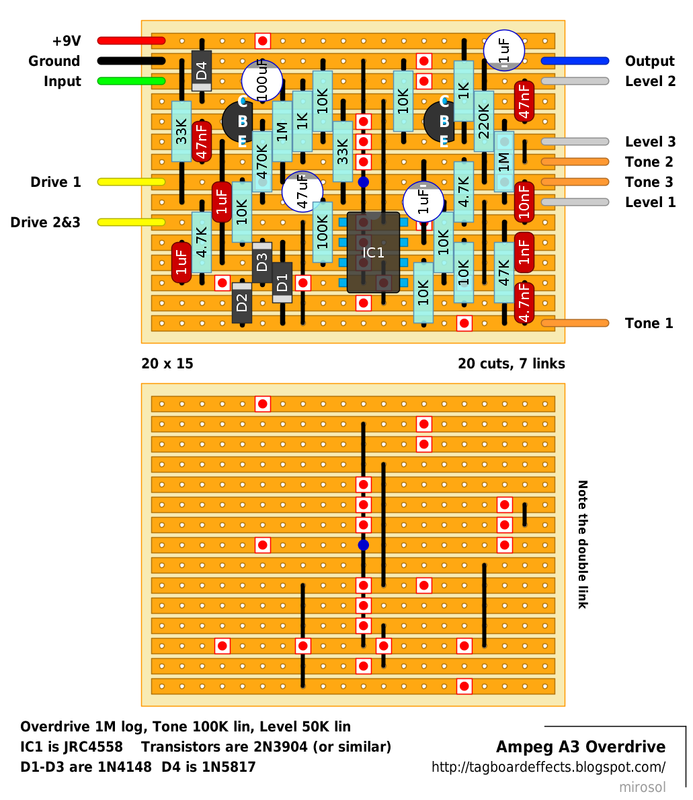 if you reverse lugs 1 & 3 on the tone pot, you can VERIFY IT. this one has a TON of distortion on tap, but with the overdrive cranked, IMO, the dirt is a bit 'messy' sounding( so i'm going to work on that). 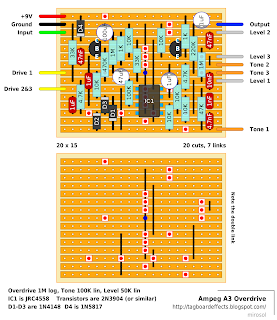 with the gain/overdrive control set at minimum, with the volume dimed, it's below unity gain, so it doesn't have all that much output at lower overdrive settings. I remedied that on mine by replacing the 10K that goes from pins 6 & 7 on the opamp with a 47K one. now it has a lot of output. Cheers John. I'll update the labels and tag it when i'm back home from work. Is this an overdrive specificly for the bass? not really, but it does have a lot of low end. BTW, I did find one error. D3 is supposed to connect one row down (to pin 2) otherwise the pair, D2 & D3 does nothing..
Ah. True. I'll fix it in the evening. Built this using John Kallas's mods from his photo plus changing that 10k to 47k. 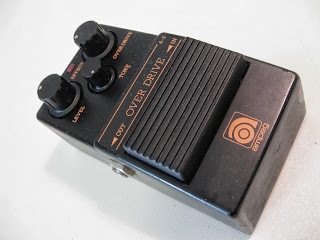 Nice overdrive!